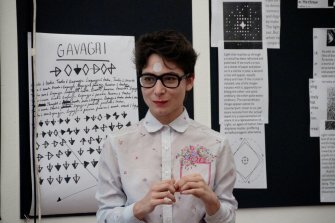 Snejanka Mihaylova è filosofa del linguaggio e performer. Dal 2008 segue DasArts, Advanced Studies in the Performing Arts, Amsterdam. Tra i suoi lavori: Silvia Pasello con Silvia Pasello (serie di performance irriproducibili) Eupalinos (performance) Abeceda (collaborazione con Larsen, concertoperformance) Il tempo che resta (video) La restituzione della parola all'organo (performance) Tik, studio sul movimento interrotto (performance). Nel 2000 riceve il Premio Mimmo Paladino come giovane artista. Tra le sue pubblicazioni: L'amore è più freddo della morte, con Joe Kelleher in Kinkaleri, La scena esausta (Ubulibri, 2008) la traduzione di Homo sacer di G. Agamben (Sofia, 2004), No object per Artimo (2003). Nel 2004 fonda Limitrophy Theatre insieme a Nickolai Nickolov. Snejanka Mihaylova is a bulgarian artist and writer. She lives between Sofia and Amsterdam. After the degree in Philosophy of Language at the University of Florence, she attends DasArts – Advanced Studies in the Performing Arts (Amsterdam) and the Jan van Eyck Academie (Maastricht). After a research study about the act of performing and its funding elements resulted in Eupalinos (2001-2006) which earned her the Extra Award (2009), another researching period begins under the name of Theatre of Thought; here, theatre paradigms are analyzed in their most extreme declinations to be collected in an homonymous book (Critique & Humanism, 2011). In 2013, in the framework of the exhibition Beyond Imagination, Practical Training in Thinking (The Last Books Edition), where she reports some dialogues (with philosopher Mladen Dolar, among others), is produced, published and included in the permanent collection of Amsterdam’s Stedelijk Museum. Between 2013-2014, If I Can’t Dance produces her work entitled A Song, performing at Festival Performance Days 2014. In 2015, together with the Acoustic Thought (book and song) investigating the relation between thought and voice, she starts the research project Inner stage - Spiritual Mothers.